The relationship between Cellular radio and WiFi can be characterised as a happy chance encounter along the road to broadband. WiFi happened to be there in large number of people’s homes to solve two problems the cellular mobile industry did not anticipate. The first was the massive rise in demand for data and the second was the unreliable indoor coverage of 3G at 2.1 GHz. It has become the norm for the smart phone to default to Wifi at home and in our place of work. We have arrived at a quite remarkable outcome where WiFi signals now cover over 1500 square kilometres. This is the summation of all the home coverage and spillage onto the street in front. But this extensive coverage has been shattered into 20 million tiny inaccessible fragments by an inflexible encryption approach. It is a lost opportunity on an epic scale. Today is a watershed moment for both the cellular mobile industry and the WiFi industry. WiFi usage is reaching saturation at 2.4 GHz. The next step on the WiFi road map is 5 GHz with poorer wall penetration. The next step is a massive jump to 60 GHz with even poorer wall penetration. Whilst the industry will extoll the benefits of the high data speeds possible at 60 GHz the consumers will come to hate its poor coverage and wall penetration. Yet is it being offered as the only WiFi route to Gb/s data connectivity. Mobile network operators already know of the problematic building penetration at 2.1 GHz where H3G has long complained of their competitive disadvantage over the 900 MHz mobile operators. The 4G services at 2.6 GHZ will fare worse in getting into homes and offices from the outside. And 5G services at 3.6 GHz will fare even worse. 26 GHz is not even seen as a starter for outside-in coverage. The case is overwhelming for the mobile operators to build a bold 5G indoor coverage story at 3.6 GHz. 5G at 3.6 GHz has a significant competitive advantage on the home hub road map as it can offer data rates much faster than the existing congested 2.4 GHz WiFi and better coverage and wall penetration than 5 GHz and certainly 60 GHz. If the cellular mobile industry worked together on this indoor 5G story at 3.6 GHz it could deliver another 1000 square kilometres of 5G coverage within 10 years, only this time it can be better planned to provide a more flexible approach to encryption and public/private usage models (ie mini open NeutralHosts). 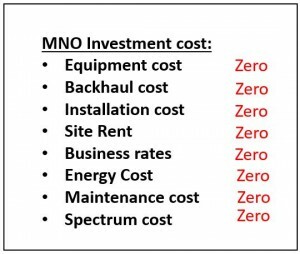 The prize is that this coverage can be provided at almost no cost to the MNO’s if the 5G functionality comes build in with WiFi in the next generation of home and office hubs. The naturally spillage out into the streets then provides extensive 5G outdoor coverage in suburban areas. With the right approach the MNO’s would be well positioned to aggregate these millions of coverage fragments into something really worthwhile whilst improving the interference conditions within the home between private cells (including WiFi) and making 5G-WiFi transitions a seamless experience, not just for the home or office owner, but their visitors as well. 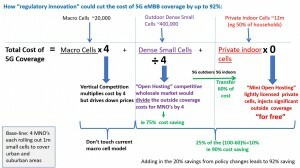 This outdoor coverage will not be as good as a well-planned dense cell public network but it will exist in areas that will never be economic to cover with public 5G networks at 3.6 GHz and it is potentially “free” of cost to the MNO’s if they can find a way to capture these millions of tiny coverage fragments into a usable public coverage. A broad-brush guess is that these uneconomic outer suburbs of cities and towns amount to 60% of the entire urban area (on the simplistic assumption the urban area is contained within a circle and half way from the centre the footfall is too low to justify investing in a cell). At first glance MNO’s may prefer to cling onto the current “exclusive spectrum” approach but spectrum innovations is likely to deliver a better overall outcome. First the need for exclusive spectrum is far less for higher reaches of the spectrum. At 3.6 GHz much of the spectrum is likely never to be used in over 90% of the country (by geography). Second, lightly licensed use will be designed not to cause harmful interference to the primary MNO spectrum user. Third, MNO’s are unlikely to achieve the massive volumes comparable to WiFi using their distribution channels alone. Lightly licenced 3.6 GHz spectrum (over licensing) is the only viable route achieving a virtuous circle of high volumes, low costs, high penetration and eventually leading to the 1000 sq km of coverage to be harvested and bundled into a more compelling consumer 5G broadband proposition that can enjoy a price premium. 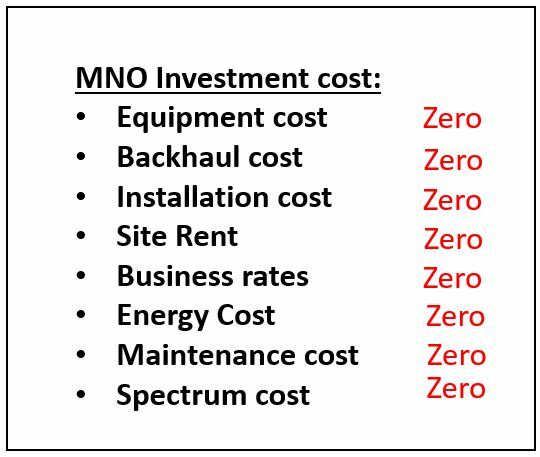 Lower cost indoor 5G cells will also drive down the cost of 5G outdoor public cells and deliver an addition benefit to MNO’s. The FCC Citizens Broadband Radio Service (CBRS) at 3.5 GHz is a good pathfinder but can be improved upon (leap-frogged) with an innovative way of private users paying for valuable 5G spectrum by agreeing to pool a small percentage of their private cell capacity for use of those visiting their homes, offices or the street just outside. This inside-out approach allows the MNO investments to be focussed on the viable central city and town areas and removing the need to cover the 60% of unviable suburban areas. On top of this neutral hosting (whether by a independet 3rd party or each mobile operators acts as a neutral host and federating all the coverage) public network costs could be cut by a dramatic 75%. There is probably another 20% savings to be found through policy changes such a fair rents on public sites site (eg volume discount) and cutting planning red tape. Each of these approaches to cost saving can stand alone but combing all three leads to an overall cost saving of 92%. 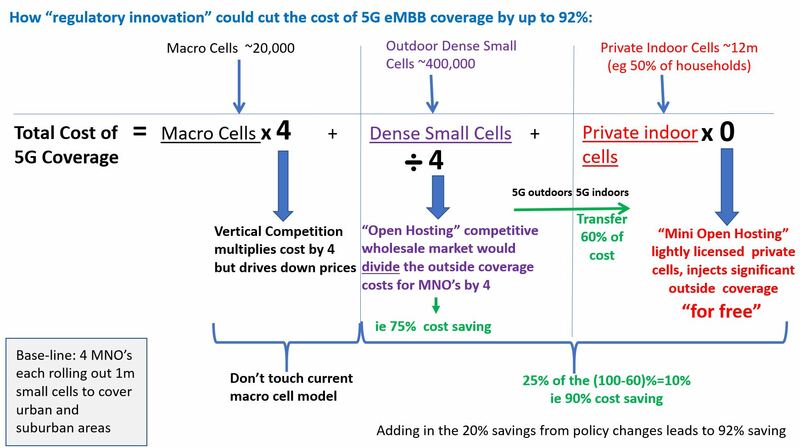 It has been mentioned earlier that the prize is that this “free” coverage can be provided at almost no cost to the MNO’s if the 5G functionality comes build in with WiFi in the next generation of home and office hubs. This means that the decision by MNO’s whether to try to capture this “free coverage” does not have to be taken for another 7-10 years providing the decision by regulators and industry on what gets built into the next generation of home and office wireless hubs is taken now. Fortune favours the brave. You are currently reading "Regulatory innovation can slash the cost of Gb/s mobile urban coverage by over 90%"